Years before any of us knew that Darth Vader was in fact once a young Jedi named Anakin Skywalker, the former pupil of one Obi-Wan Kenobi and obsessive husband to one Padmé Amidala, he was nothing more than the cool dude with the telescoping Lightsaber and trendsetting vinyl cape. The Dark Lord of the Sith still stands as one of the most iconic action figures of all time. Kenner only produced one action figure based on Darth Vader through the entire run from Star Wars to The Power Of The Force, but they did manage to repackage the figure on every card. 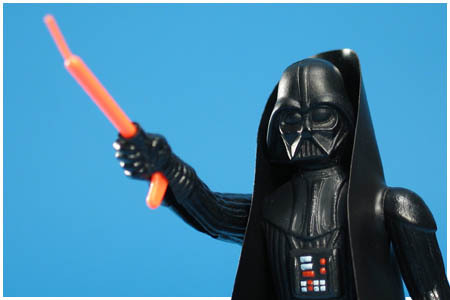 Very few of the earliest released Darth Vader figures featured a double telescoping two-piece Lightsaber. The accessory was switched out to the standard one-piece Lightsaber as early as the 12 Back A cards. Though all vintage figures have minor variations, the only major variation in the figure itself is the hard to come by Japanese Takara version, which, though in a similar stance, is an entirely different sculpt. It is easiest to spot by looking at the head, though still difficult to spot for the untrained eye.